CHALLENGE #17: We are constantly being asked to put something in welcome bags for consumers. What can we give out liberally – that won’t break the bank – and that people will say, “Oh wow – I could really use that!” ?? - JAE associates Ltd. SOLUTION: While we’re really not fans of any kind of shot-gun marketing, if you do need to spread yourself around, this SCREENEEZZ is perfect. It’s also ideal for home-owner directed mailers. If you’re like me and ever walked into a screen door not realizing it was in place, you’re probably not proud of the word you used once you embarrassingly bounced off it (sigh). The SCREENEZZ helps all guests (and pets!!) save face – and be safe – by displaying a two-sided graphic panel with magnets in between. It’s easy to attach, repositionable, and gives the homeowner a reminder of your branding message all summer long. 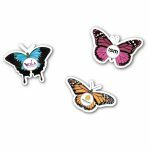 They’re domestically made, come individually packaged, can be made in custom shapes and can include an enhancement card with a coupon, message, or other call-to-action.